Last night, Bell, a Canadian phone company, accidentally posted a preorder page to Google’s super secret phone project, the Pixel. Then the British phone store Carphone Warehouse leaked even more pictures. 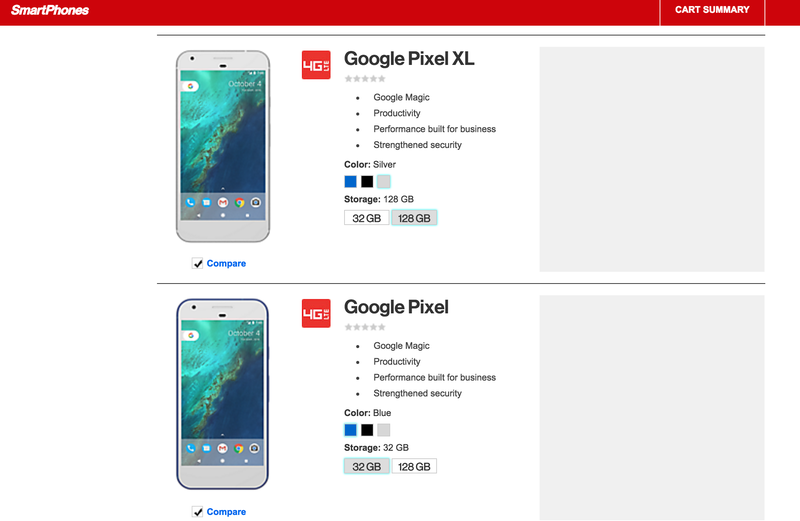 Now it appears Verizon also accidentally posted early images of the phone, and revealed it will contain something called ‘Google Magic.’ An anonymous tipster linked Gizmodo to the smartphone section of the Verizon Enterprises site—the sector of the company that sells plans to businesses, not consumers—the Pixel and the Pixel XL are listed for sale. So what is Google Magic? Probably software? Or maybe just some marketing shenanigans? Siri’s evil, yet more powerful twin? A colleague of mine speculates it’s probably exclusive Pixel software that has gesture features. “Magic” feels like an uncreative name for powerful software to me, so it better be really damn magical. Also, the phone comes in blue. Funky! We already know plenty of what Google has in store for tomorrow. Gizmodo will, nevertheless, be covering it from San Francisco, even if everything gets leaked beforehand. We’ll still be there. Have any more scoop on Google Magic? Tip us at eve@gizmodo.com or tipbox@gizmodo.com.